The Wizard Toronto Comic Con has been announced as having it’s third incarnation taking place on March 24-25, 2012 at the Direct Energy Centre (where the event has taken place since launching). Guests have already been announced. Back in late June it was noticed that the show had dropped a day from the schedule, making it a 2-day event. Well it seems that the dates are an impossibility at the announced facility, something that would have been known at the time that the show dropped the third day in late June, because it seems the facility had been completed booked by other events before then. This weekend in Montreal it was pointed out to me, and corroborated today with the schedule on the Direct Energy Centre’s website and on the event websites for both CANADA BLOOMS and the NATIONAL HOME SHOW there is no possibility the Wizard show is taking place in the Direct Energy Centre on the announced weekend as the entire facility has been booked between MARCH 16-25, 2012. Note that TCC is not on the schedule on the DEC website at all. 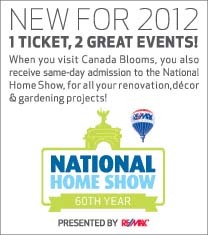 Canada Blooms is pleased to announce that we will be co-locating with the National Home Show. You can now enjoy 2 wonderful events for one low admission. Canada Blooms: The Flower and Garden Festival and the National Home Show have signed an agreement that will see the two powerhouse events taking place side by side beginning next year. This will result in creating the single largest home and garden experience in North America. The agreement to co-locate is not a merger, each event will maintain its own identity. Both shows will run for ten days, from March 16-25, 2012, at the Direct Energy Centre. Canada Blooms, presented by Home Depot, will create and expand their feature gardens and floral displays in the larger Hall A with the Canada Blooms Marketplace moving into Heritage Court. The National Home Show, presented by REMAX, will occupy Halls B, C, D, F, G and H.
Please note: There is no Hall E. Wizard Toronto was held in Hall A in 2010, Hall D in 2011. There was also a jointly released press release that is available as a viewable PDF on the National Home Show website. With the last minute cancellation of the September 2011 Los Angeles show last month, and the dropping of the Central Canada Comic Con in Winnipeg without any warning, could this be seen as a warning sign that Toronto is being dropped from the tour? Or are there plans to reschedule the event to a different weekend? Or on the same weekend but in a different facility or location? Exhibition Place does have other buildings to rent that may be available such as the Better Living Centre, the Queen Elizabeth Building and the Automotive Building (now rechristened the Allstream Centre by Exhibition Place). We did use the Queen Elizabeth Building for the first two Paradise Toronto Comicons in 2003 and 2004. It’s a real bunker from the Mad Men era, but it is self-contained and has a theatre adjacent (if not booked for other functions) and a room that could be used for panels. Did Wizard just drop Boston (New England Con) from the tour as well? In June they dropped everything (incl. Boston, Miami, New Jersey, Winnipeg, Nashville) but 8 —- Anaheim/LA, Austin, Big Apple/New York, Chicago, Mid-Ohio/Columbus, New Orleans, Philadelphia, and Toronto. Anaheim got cancelled in August and then there was a discussion about an LA show in April 2012, but with the Wondercon announcement that they were moving to Anaheim for a year, Wizard announced that they weren’t doing an LA show — leaving them with 7 cities for now.